The bad weather really hit as it poured with rain all morning. It tapered off a little by mid-day so we ventured out around 1pm with the plan to stay out until late evening. The small group of people aboard this ship are all-weather nature lovers and not easily deterred. With an extra layer of rain gear we headed out in the skiff. On our way to shore we passed a group of sea otters floating on their backs. They are very shy of small boats so we were not able to get really close. It seems that the tidal flats of this bay hosts only male bears who are most active later in the day. As we were a little early for the evening bears we walked many miles and crossed dozens of streams scanning the riverbed for bear activity. The bears however remained elusive until near the end of the day. Finally just as it started to rain, the bears came out to fish. Beach Boy appeared and was sitting beside the stream watching the salmon swim by, but was unable to actively fish because of his injuries sustained the night before. It was terribly sad to watch him hobble across the river, unable to chase down the fish. We are all concerned that if he does not eat soon he will become weak and unable to defend himself. By the time evening arrived it was raining hard, but we had three bears within close proximity and the viewing was just to good to abandon our post sitting on the rocks between the braided streams. At this point it was almost impossible to take photographs, the wind had become quite a factor and was blowing the rain all over our gear. But it was all worth it when one of the dark brown bears wandered up the stream where we were sitting and passed less than 20 feet from us! I kept him in my zoom lens until he was too close and then I just had to ignore my camera and admire this outstanding animal. I had loaned my little point and shoot camera to a fellow passenger and had asked him to video the next close encounter. The bear passed him only 17 feet away. I hope to upload this on youtube when I get home. This type of bear viewing is only possible in a handful of places in the world. 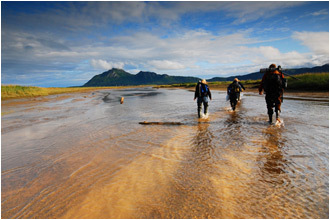 Katmai is completely unique and with the help of our experienced guides, we are in no danger. The guides are experts in bear behaviour and we go unarmed save a bear flare to ward off a potential threat. 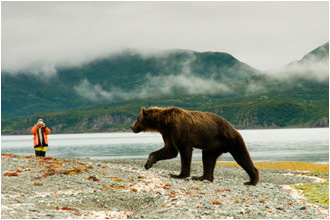 The Katmai bears are only interested in the abundant fish and humans are bearly worth a sideways glance. Humans pose no threat as the bears here have not been hunted here since the 1920’s, and do not connect people with any food source. Knowing all of this does not stop your heart from pounding when these 1000 pound bears comes in such close proximity. It is truly the thrill of a lifetime! We arrived back at the ship, soaked, cold and totally ecstatic from the days events.